As colleague Woning already announced in the previous Aardschok, shortly after the release of the Death Live in LA CD/DVD, the performance on D.O.A. has been released in the same way. The CD and DVD come out on October 29th and are only available for a very friendly price at Nuclear Blast (for details see album page). 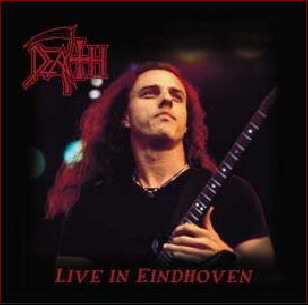 $2.50 of every CD will be transfered into the Chuck Schuldiner Medical Fund. Many people probably already know the recordings of D.O.A. '98 because back then the Death concert was broadcast by Kink-FM. With the exception of the classic "Pull The Plug" the tracks are mainly from the later - more technically orientated Death CD's. The sound is very good, and the music of course is awesome. Therefore you just have to buy this CD for only 15 German Marks. Because I still haven't seen the 'Live in LA' DVD (yet), I can't compare both DVD's. But in the case of 'Live in Eindhoven' the images honestly add little value. Visually, except the virtuoso playing of the band members, there's not much to be seen. The latest Death line-up doesn't care much about the stage performance. No headbanging, and not much presence. Don't get me wrong, I think Death is a great band and of course the music speaks for itself, but a little more movement on stage would have made the DVD more attractive. Further we can't complain about this DVD/CD, just buy it.